Majorities of impoverished Chitungwiza masses are suffering the debilitating effects of lack of basic services, resources and facilities a research has said. According to the research done by Zimbabwe Democracy Institute (ZDI), a local think tank in partnership with Chitungwiza Residents Trust (CHITREST), the majority of the impoverished Chitungwiza residents are suffering the devastating effects of a lack of basic services, resources and facilities. Speaking at the report launch of the report today Mr. Fortune Gwaze of ZDI said that government has a mandate of availing resources to its citizens as enshrined in the international law which states that governments have a responsibility to respond to conditions which can violet fundamental human rights. “We have interviewed more than 300 residents who confirmed a plethora of problems being experienced in Chitungwiza. Councilors are getting more houses than they should have and selling it to the people with high prizes and nothing has been done to that,” Gwaza said. The report also outlined the intensity of water woes in Chitungwiza. “60% of the respondents confirmed that the council have been providing safe and clean water only two times per week, 23% said 3times, 16% says never while no one confirmed that clean water is being provide to them on a daily basis,” says the report. 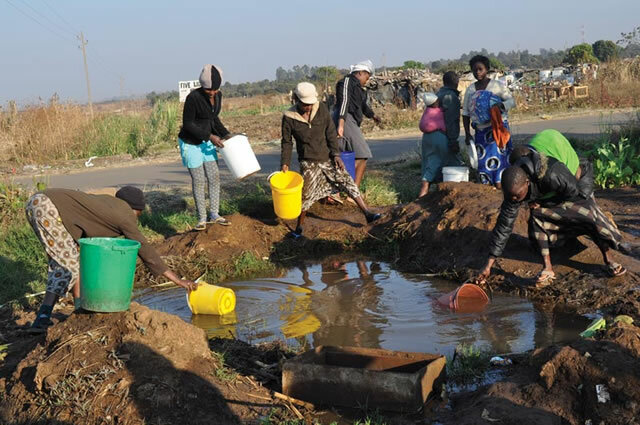 According to the report, Chitungwiza residents are against privatization of water by the municipality and when asked whether they approve or disapprove of the plan to introduce pre-paid water meters in the area, 82% are against. On the positive and extreme positive, 6% approve and 5% strongly approve while 7% are neutral. “All the respondents indicated that they are affected by massive power disconnections, 97% complained of inaccessible clean and safe water, 98% cited poor infrastructure, among other things.” reads the report. Mr. Kazoro from Zimbabwe Human Rights Commission (ZHRC), applauded the findings of the reports and indicated that ZHRC is very happy to work with other groups to protect the human rights of the Zimbabweans. “We create space for voices to be heard and citizens should know their rights and should use constitution to protect their rights,” said Kazoro.